Order Online In Time For The Holidays. The FrancisFrancis! X6 espresso machine, the latest collaboration between renowned Italian espresso machine maker FrancisFrancis! and architect Luca Trazzi, the X6 features an 18 Bar pressure pump and unique Trio Technology that makes three espresso preparations: short (ristretto), normal (espresso) and long (espresso lungo). With quality all-brass boiler and brewing components, the Francis X6 is designed to work exclusively with E.S.E. Servings (pods) for perfectly measured and tamped espresso every time. And the stylish retro-contemporary design makes a strong visual statement in any kitchen. Free Set of 4 espresso cups with purchase! 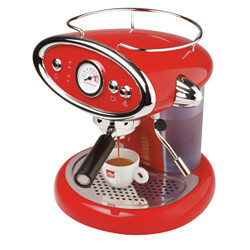 New low price: $399.00At 1st in Coffee we feature espresso beans, espresso machines, coffee grinders, frothers and coffee makers. We feature the Jura Capresso espresso machine, Rancilio silva , Super Automatics, Saeco, Saeco Coffee Machines, La Pavoni, Electra, Pasquini, Isomac, DeLongi, Francis Francis, Nespresso Machine, Salvatore, Vibiemme and Cuisinart brands.